Welcome to the third entry in a series I am calling â€œpractical Japaneseâ€ where I share a photo or video showing hiragana, katakana or kanji being used in a practical everyday sense. The aim is to expand the vocabulary of fellow Japanese learners so they may get familiar with seeing and hopefully using simple Japanese that they will most likely encounter. My Japanese train obsession got out of hand while in Japan with my romantic experience with the Narita Express being a good example. I enjoyed the times I spent at train stations and riding trains especially the Shinkansen and while waiting on trains I’d go crazy taking photos as can be seen in my post – Shinkansen 700 and N700 series gallery â€“ A Densha Otakuâ€™s Wetdream. Today I bring you a simple but practical train related sign. lol. I always remembered that kanji as “There’s a tree kanji, trees make smoke when they burn so…. 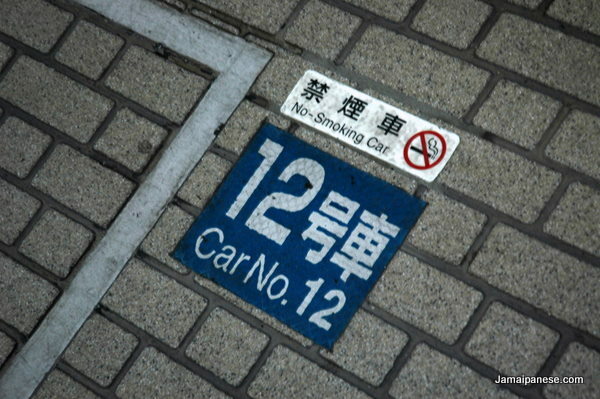 NO SMOKING!” Little did I know the second kanji is the one to do with smoke.